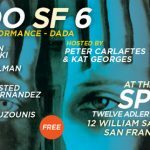 120918: Madcap Dada Performance & Poetry Hits North Beach, SF! 060918: LaDiDada! 6th Annual Dada Salon at Beyond Baroque, Venice, California!